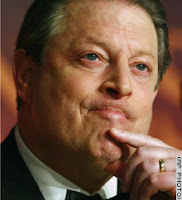 The Ostroy Report: Is this the Sign We've Been Waiting for About Al Gore Running for President? Is this the Sign We've Been Waiting for About Al Gore Running for President? On Air America Radio's "Sam and Army" program Thursday morning co-host Sam Greenfield said he has learned that Al Gore has instructed the Harry Walker Agency to cancel all of his scheduled speaking engagements for the next six months, indicating that the former VP has decided to seek the presidency in 2008. "I guess he's running, " Greenfield said. Dear Andy, You are proving to be a genius. I was almost begining to wonder. Then you come up with this tantalizing tidbit. Of course, you always get the scoop on the goods. Thank-you for sharing. What a great battle it would present. What better times could one live in than now? We're gonna come back strong if the world would embrace him and he would grace us with his inspired leadership and fearless presence as the Chief Commander of our great nation. We shall see. I will support if he steps-out once and for all. I feel sorry for Obama but he will have too wait 8 more years. It's only right and that's the way it shall be. I don't see hillary going all the way. Nope, just don't see it. I'm planning to see Waitress this weekend. It's playing at a great theatre in L.A. Thanks again and i will send only positive healing thoughts your way. Take care and keep us posted on the latest. Andy, like you, I hope this is a portent of good things to come! He's got my vote already! Al Gore is a nub. I admit, he is better than all the other Democraps. Is he really going to try to kill all the world's worm supply after the German scientists discovered that worms do more Global Warming damage than humans? Jim Frederickson, the research director at the Composting Association has called for data on worms and composting to be re-examined after a German study found that worms produce greenhouse gases 290 times more potent than carbon dioxide. Worms are being used commercially to compost organic material and is in preference to putting it into the landfill. The German government wants 45% of all waste to be composted by 2015. "Everybody... thinks they can do no harm but they contribute to global warming. People are looking into alternative waste treatments but we have to make sure that we are not jumping from the frying pan into the fire," said Frederickson. Yeah. Gore will save our country and the world. No wonder the Repulbicans who posted about worms are worried. What will the they then stuff their heads with? Or do they eat them first? "the they" will probably not stuff their heads with anything. What do you stuff your head with? Thank you Andy for the post, what GREAT news it is. As I've said before, it was your interest in Al Gore that got me to your web site way back when. When you look at all the things that make up for an Al Gore run there leaves no doubt. Al has changed since 2000 and is not the person he was, he's relaxed and focused. He has become a multi-millionaire and could put in 40 million of his own if needed. He is on the board of some really high rolling companies and is very friendly with very high up people, the list is too long to even start. He has Current TV network. He has his movie now in DVD still showing strong. He won an Emmy, won an award in Europe comparable to the Emmy (can't remember the name), he is up for the Nobel Peace Prize, his new book is a hit, he continues to pack the house for speeches and it goes on and on. I feel that Al will run and all he will have to say is, "I will give it another try and this time it will be up to everyone to decide if they have had enough and want true changes this time". He has already won once and this time the world is behind him, he is loved everywhere. We just got back from a months vacation in eastern Europe and believe me, Bush is hated and Gore is loved and is talked about on the TV stations. If Al runs I will be a tireless worker here in Florida. If Al runs, he has my vote. He is the most experienced and the most intelligent. Who would Al make his VP? As a Canadian who lives on the border with the USA I have to say, we are less and less willing to listen to or even tolerate a lot of the American media. The lies and distortions are stunning to those of us who also have access to news from abroad. In this light I can sincerely say that the solution to the US's salvaging of it's reputation internationally lies in Al Gore. All the USA needs is to get Al Gore into office, send Bush and his cabal of neocon psychopaths off to the Hague for trial and execution as war criminals and then you can buy back your economy from China and the Saudis and, with any luck, we'll be able to reverse the path of death and destruction the GOP has pulled your nation into. All in all, Al is your only REAL hope. The only reason you are free is because of your proximity to the United States. How's it feel to be a defensive parasite? 8:40 Thank you so much for your very intelligent and enlightening post. It's advice the idiots who still stupport Bush should heed. We are troubled by the problems you point out. We know that we need a man of Gore's caliber to clean up the mess and hopefully fix the media. You sadden me to think a person with so little insight, intellence still has access to a computer. Maybe they should put you back in the play therapy room with the sandbox. As far as Canada being a parasite.... we provide the USA with more than they have, or could be capable of, EVER provided for us in any way shape or form. Your nation is dependant on us not the other way around. We provide you with food, energy and water. Things that your own nation is incapable of providing. ....and as a note... my freedomn came from the sacrifices of my forefathers who took up arms to save YOUR NATION not the other way around. The US has never come to the military aid of the Canada but has requested our help in every conflict. Including the current ILLEGAL OCCUPATION AND DESTRUCTION OF AFGANISTAN AND IRAQ. Thankfully, SOME of our politicians actually had some collective brains and testicles (unlike some politicians). Only someone who is a complete historical and factual MORON would even dream of saying something so stupid. Please, keep your fingers in your pants where they belong and off the keyboard where intelligent people are trying to have a discussion. Go on, go back to the little kids table and we'll cal you if we need a laugh. The real sign was his son getting busted in California. 1:32 The real sign of what? That his children are as bad as Bush's two drunken daughters, or Jeb's drug using children; or Bush himself who was arrested for druken driving? 12:34 Obama admitted it whereas Bush wouldn't talk about it. When I was "belonging" to my high school crowd by smoking cigarettes I never inhaled but took the smoke into my mouth and blew it out. I faked it and no one ever called me on it. I presume Clinton did the same with his marijuana try. Yeah right, and Peter Rabbit is hopping down the bunny trail. The biggest joke and scam artist I have seen in my life of 60 years. Global warming, people it's just another unique way of getting your monies (taxation without representation), plain and simple. Secondly to get you out of your cars and into mass transit systems that hasn’t been self-sufficient in years, or pay one heck of a penalty fee out of pocket for you using that automobile! It's been a record cold year, and it's a cycle the earth goes through now and again. LOOK it up, READ about it! Seattle's mayor Greg Nichols is proposing this: A twenty-cent payment for 'each and every' paper/plastic bag used while shopping at any store! Easy money isn't it? What happens to the people whom make these products, you got it.... laid-Off! Seattle has the most predominate recycling system in the nation. People wake up and speak up! This is tax that the politicians can increase their revenue's three fold, with an "excellent Excuse" for you to buy into it! You have been enlightened and warned! Young people time to wake up, get rid of you Ipods and listen and learn about the realities of life. For you are going to be the keepers of this planet now, and if not.... 'real soon'!